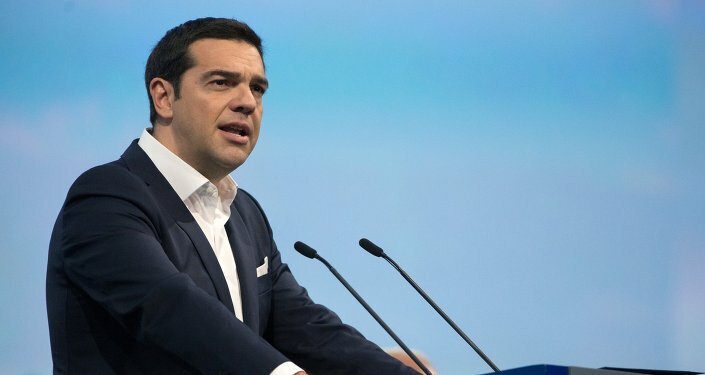 Greek Prime Minister Alexis Tsipras’ visit to Russia to attend the St. Petersburg forum and meet with President Vladimir Putin this week has strengthened Moscow-Athens ties and has drawn Greece further away from Brussels, a leading Spanish newspaper wrote. "Russia is ready to lend a helping hand to Greece, this is the main conclusion with regard to the results of the St. Petersburg forum that Europe should draw," Spanish newspaper El Economista wrote following Tsipras' visit to Russia. According to El Economista, Tsipras flew to Russia with good reason: he met personally with [Russian President Vladimir] Putin and was able to find common language with him. However, the Greek prime minister's participation in the St. Petersburg meeting is actually distancing Athens from the European Union but the Greeks seem not to be scared, the newspaper noted. President Putin and Greek Prime Minister Alexis Tsipras met on the sidelines of the SPIEF forum to discuss the possible routes of transporting Russian natural gas to Europe via the Turkish Stream pipeline. Meanwhile, the two countries’ energy ministers signed a memorandum to set up a joint company for the construction of the pipeline. In recent months, "Greece feels less and less comfortable in the EU" due to its ongoing talks on the country’s "giant debt," the newspaper said, noting that Brussels itself pushes the debtor-state toward an exit from the Eurozone. "But there are still places in the world, where Greece feels quite comfortable, and Russia is the first among them." "I'm in St. Petersburg because Europe is no longer the center of the world, there are new powers," the newspaper quotes Tsipras as saying. "Greece and Russia are doomed to rapprochement in such circumstances," El Economista concluded, "especially if one remembers that both [countries] belong to the same branch of Christianity — [Eastern] Orthodoxy."